Lou Brown kicks off the Penn State coverage weekend with his take on the sanctions levied by the NCAA earlier this week. This is my second, and hopefully final, post on the tragedy/debacle at Penn State (for my previous post click here). After many months of speculation, on Monday the NCAA finally imposed unprecedented punitive action against the Nittany Lions. The details are well known, but let’s just repeat them once more for perspective: a $60 million fine (an amount equal to the average annual revenue of the Penn State football program, to be applied towards an endowment for “external programs preventing child sexual abuse or assisting victims and may not be used to fund such programs at the university”); a four-year bowl ban; a reduction of 20 total scholarships for a four year period; the allowance of immediate transfer without penalty for all football players; and the forfeiture of all wins dating from 1998 to the present (a total of 112 victories vacated, dropping Joe Paterno from first to 12th in the all-time wins category). For Penn State, the only “victory” was its avoidance of the so-called “death penalty,” which would have suspended the football program from competition for one year. Incidentally, can we refrain from calling it the “death penalty” since “one-year suspension” and “permanent suspension” are incongruous? Regardless, football certainly won’t be the same in Happy Valley for the foreseeable future. So, there you have it: Penn State and its alumni, students, and fans have their punishment and will have to learn to live with it. 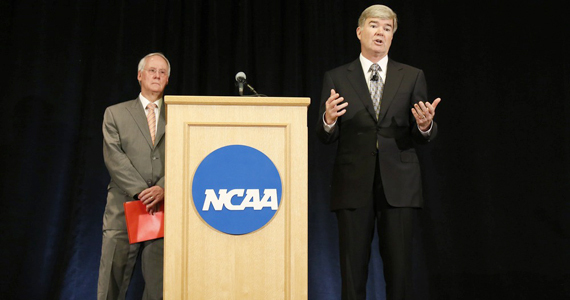 Sure, many are upset, and irrationally so, at the sentence levied by the NCAA. Let’s be honest: this reality stems from Penn State’s demonstrated inability to police itself. And that is what lies at the heart of this scandal: accountability. After all, we wouldn’t be having such conversations if the administration at Penn State had been willing to play the “bad cop” when the allegations against Jerry Sandusky first came to light (allegedly in 1998, but can we really believe the accuracy of those reports?). To its credit, Penn State cleaned house and removed a statue (more on that later), but stopped well short of self-imposed penalty befitting of its transgressions. Fair or not, it is a punishment commensurate to the crime. Those who look at the sanctions levied by the NCAA as crippling the Nittany Lions football program and punishing the fans, alumni and students, it is time to understand that football is the unfortunate collateral damage in this scandal. The penalty is not about football and neither was the scandal. Rather, it centered on trust, or a lack thereof, stewardship, and above all, accountability. The administration at Penn State, from head football coach all the way up to president, betrayed their alumni, students and fans in a severely misguided attempt to preserve the public image of the football program. Since football seems to be the only language understood in Happy Valley, it is only fitting that the punishment would be levied in football terms. Let’s get this straight: any effective punishment focuses on attempting to correct bad behavior and prevent it in the future by depriving the actor of something he or she really enjoys. It’s supposed to be unpleasant. For example, if your kid is a brat and punches his younger brother, you tell said brat that he can’t have a cookie. He’ll cry blue bloody murder and throw one hell of a tantrum. Yet, your punishment doesn’t imply that cookie is at fault for the brat’s behavior or that you have some kind of personal vendetta against cookies. So it is with Penn State. I don’t think anyone, in the Big Ten or otherwise, is pleased to see this punishment imposed upon the Penn State football program. However, I think everyone is hopeful that the message has been delivered loud and clear: transgressions of this magnitude deserve scorn and will be punished severely. Let’s hope that this message was universally understood, not just in the world of college football. On the eve of the sentencing, Penn State opted to remove the state of Joe Paterno from outside of Beaver Stadium. It may seem like a genuine act of contrition, to remove a shrine dedicated to a divisive figure, but deep down it rings hollow. In the end, if this tragedy deserves anything, it’s even more attention. After all, Penn State’s main offense was trying to sweep all of the skeletons into the nearest and most convenient closet. 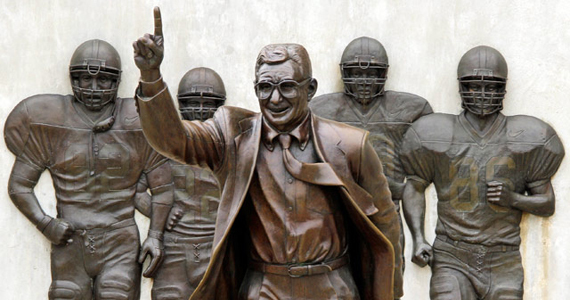 Instead of expunging the statue from public view (effectively putting another skeleton into an out-of-sight closet), I think it should have been left precisely where it was, with one minor aesthetic modification: rotate it 180° to symbolically represent Joe Paterno’s dereliction of responsibility when faced with the most difficult trail of his life. It would have been altogether fitting and apropos: when the going got tough, Jo Pa looked the other way. After all, there were football games, Big Ten Championships, and National Championships to win. That is the lesson to be learned from the tragedy at Penn State. What more fitting a way to immortalize such a heartrending lesson than with a statue you already have? Joe Paterno himself once observed: “Victory without honor is an unseasoned dish. It might fill you up, but it won’t taste good.” If only he practiced what he preached.